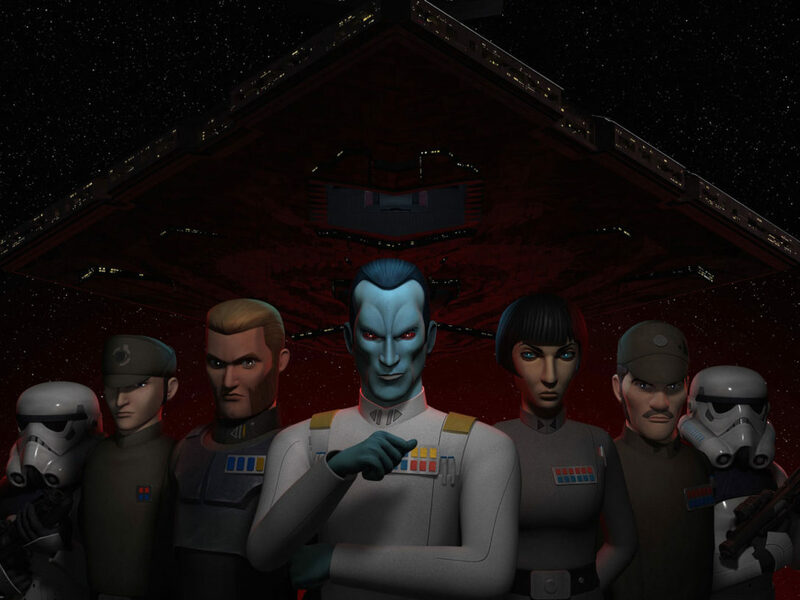 Get ready for tomorrow's season premiere of Star Wars Rebels with StarWars.com's guide to the show's biggest events. 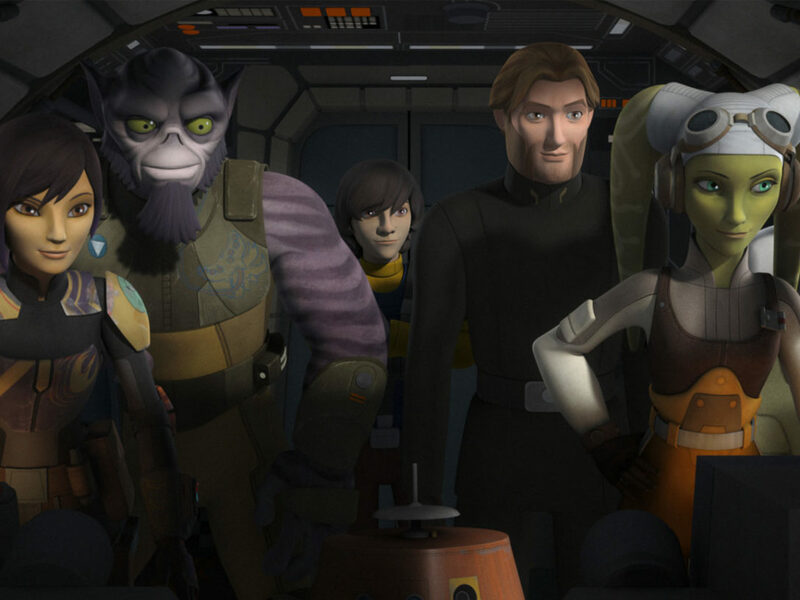 With Season Three of Star Wars Rebels landing tomorrow — Saturday, September 24, at 8:30 p.m. ET/PT on Disney XD! — here’s a quick refresher on some of the bigger plot points in Seasons One and Two. It’s amazing to see how far we’ve come and I can’t wait to see where we’re going. 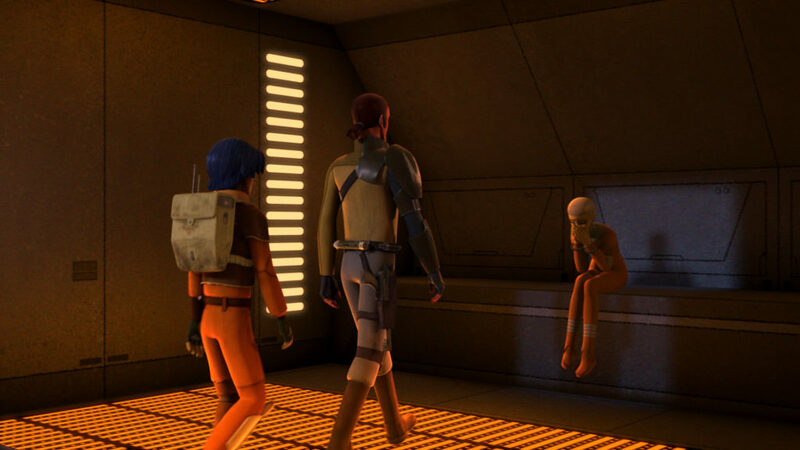 Ezra Bridger is where it all begins. 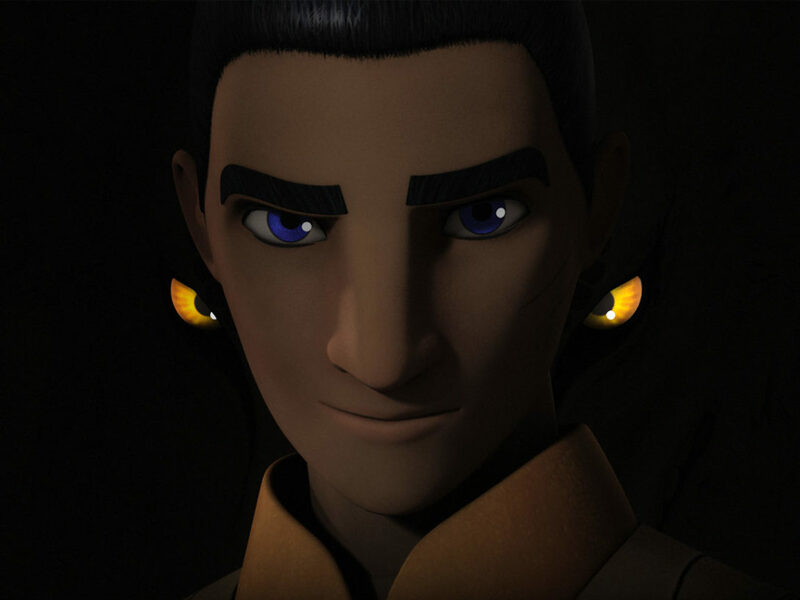 The street rat shows a potential that interests and draws in Kanan Jarrus and, by extension, the crew of the Ghost. From an epic street chase to the revelation that Kanan is a Jedi, this is a can’t miss episode. Rebels is set in the time period after Revenge of the Sith and before A New Hope. Kanan survived Order 66 as a Padawan, but hasn’t completed his training. Struggling to mentor his new apprentice, Kanan hopes a newly surfaced Luminara Unduli can better train the boy, but discovers her survival was all a trick. His doubts have to be pushed to the side and he formally takes Ezra as his Padawan. Do you think that Ezra would be different if he grew up prior to Order 66 and he could have actually trained freely as a Jedi? Empire Day is supposed to be a day of celebration. The day the Emperor took control of the Senate and the galaxy. 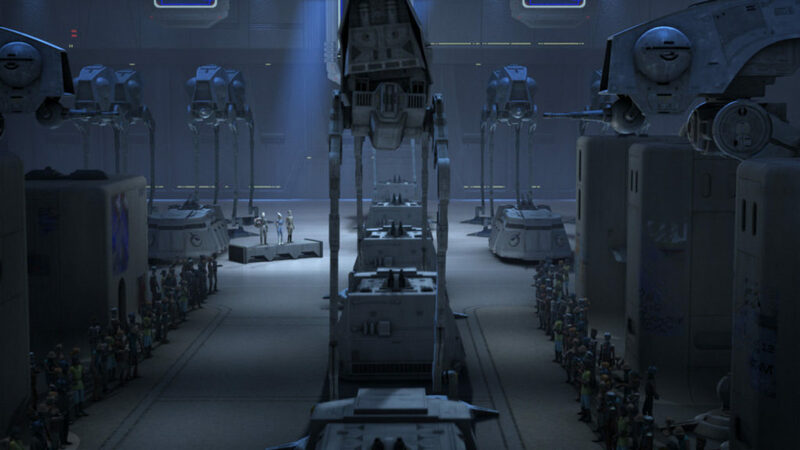 On Lothal, the Empire throws a parade as a show of strength and our rebels crash the party. We also learn that Empire Day is something else for Ezra: his birthday. His parents are just one thing the Empire has taken. There’s so much more. Pursued by the Grand Inquisitor and inadvertently tracked, Kanan and Ezra take the Phantom to an old Republic base on Anaxes. 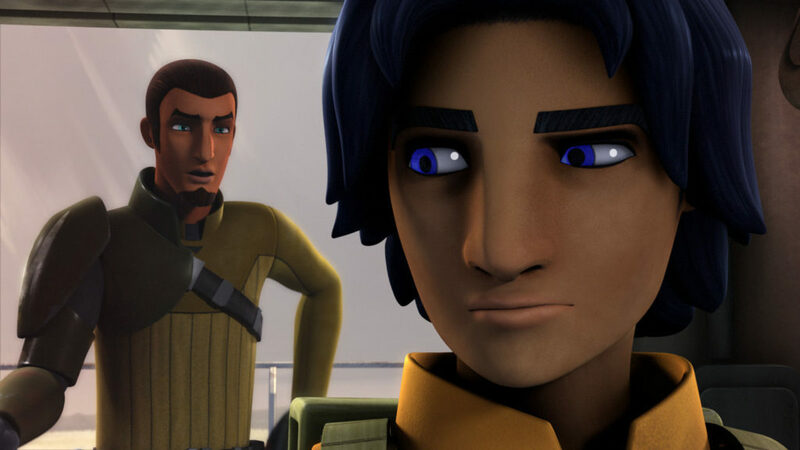 Kanan hopes that Ezra can connect with the fyrnocks that inhabit the basel Ezra does connect — dangerously so. 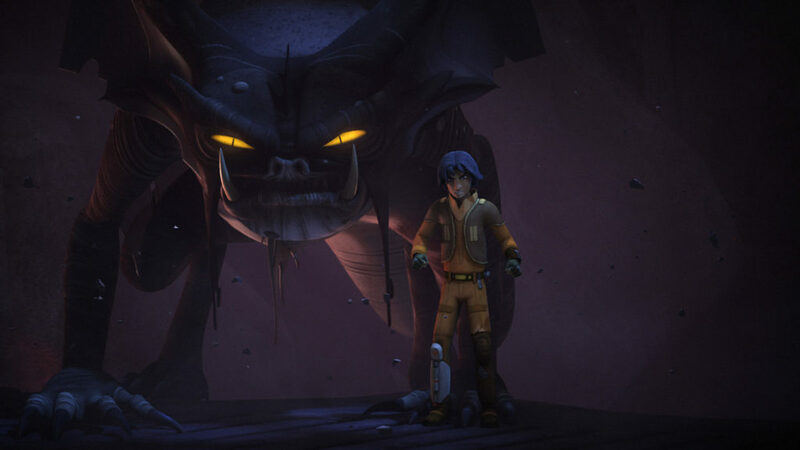 When the Inquisitor strikes, Ezra conjures a giant fyrnock through the power of the dark side. Every Padawan goes through different trails, and Kanan takes Ezra to the Jedi Temple hidden on Lothal for his first round. Whatever Kanan expected, he finds himself experiencing his own evolution as both he and Ezra are visited by Yoda. As Ezra’s Master, Kanan can only wait and hope as Ezra’s faces nightmare scenarios involving his friends and the Inquisitor. Yoda’s guidance helps Ezra better understand his new path and presents him with a kyber crystal. Lando Calrissian finds himself in possession of Chopper after a (sort of) friendly game of sabacc. In order to get Chopper back, the Ghost crew agrees to help him with a job. Lando trades Hera for goods from the nefarious Azmorigan, knowing she’ll be a self-rescuing princess (with a very handy tray). We get introduced to a puffer pig and then learn why it’s called a puffer pig. There’s a shootout, flying pigs, and a little larceny. To sum it up, it all goes stunningly sideways, but Lando’s luck — with the help of our rebels — wins in the end. The rebels have caused enough trouble on Lothal that the Empire sends someone big in to deal with the upstart insurgency: Tarkin. 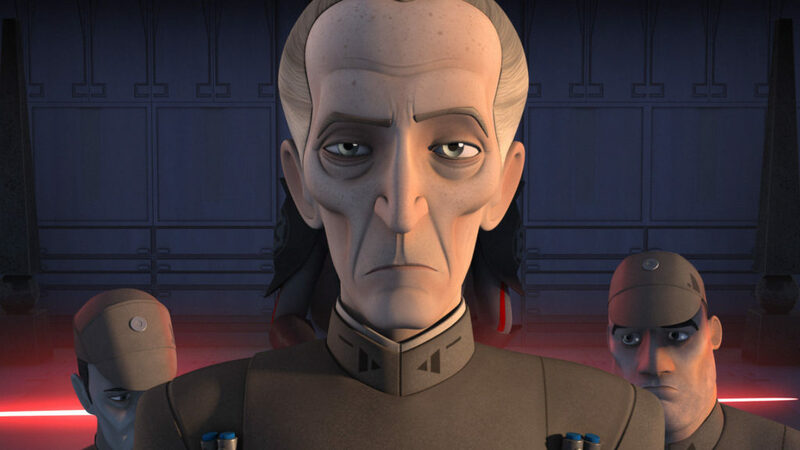 Governor Tarkin’s tactics that are far beyond what the Ghost crew are used to dealing with, and Kanan sacrifices himself so the rest of the crew can get away. Ezra broadcasts an inspiring message of rebellion using the Empire’s own transmission tower — before Tarkin blows it up. 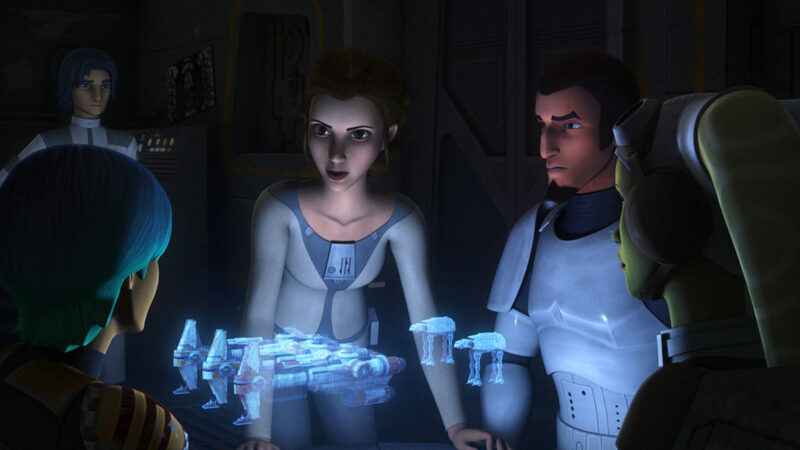 Now a prisoner, Kanan must hope the message got out, as the rest of the Ghost crew plan their next move. 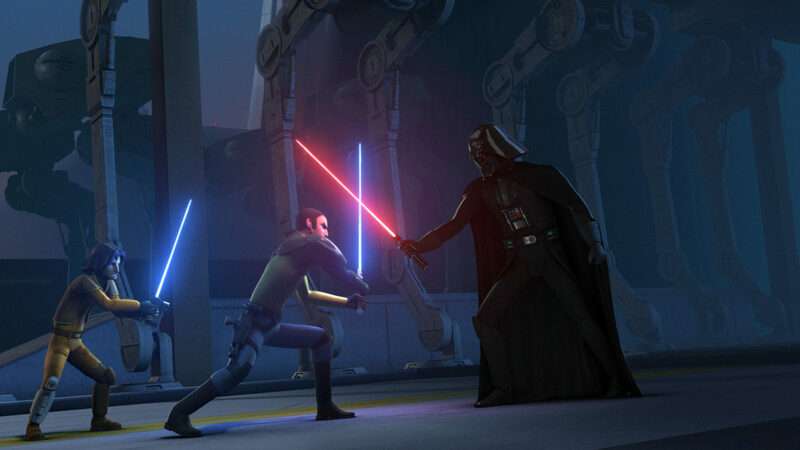 Imprisoned by the Empire, Kanan Jarrus faces torture from both Tarkin and the Inquisitor. But he doesn’t break. He doesn’t tell them anything. Not just because he’s strong, but because he doesn’t know anything. 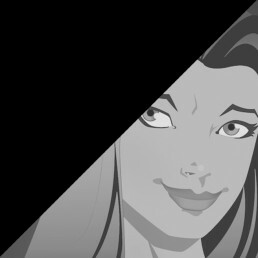 It’s what Hera and her contact Fulcrum planned from the beginning. No member of the crew knows more than they need to know. That way, if anyone is captured, the plan can’t be compromised. 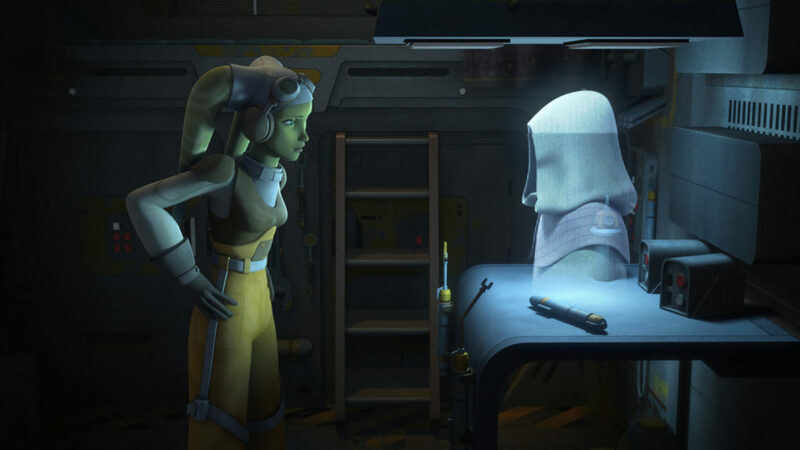 Fulcrum also advises Hera not to go after Kanan, as it would be too risky. Guess how that works out? Using the pain and self-loathing Kanan still feels over Depa Billaba’s death during Order 66, the Inquisitor scores an emotional hit on Kanan. But it’s ultimately Kanan who defeats the Inquisitor in lightsaber combat, when he lets go of his fear and fully accepts the Force. While all this is happening, the rest of the Ghost team manage a daring rescue and escape, and we also learn the identity of the mysterious Fulcrum — Ahsoka Tano. But that’s not all. Ahsoka reveals that our crew is one cell of a larger rebellion. Vader. Need I say more? …you kind of present the Vader I think everybody has wanted to see. It shows the strategy of Anakin Skywalker combined with the ruthlessness of Vader that we knew in the movies. I just wanted to ask how you came to that version of him, and was it exciting to present Vader at a time in his life that had really never been explored before? Dave Filoni: I have a strange kind of entry into it because I’ve worked with Anakin Skywalker as a character for so long. The thing that’s really apparent is just how different they are. Anakin and Vader have a different manner of speaking, and they have a different way of, obviously, reacting to things. Their physical nature is similar but different. When you deal with Vader, you have to remember that he really is Darth Vader. Everybody knows that he is Anakin Skywalker, but when he becomes Darth Vader, the good person is largely destroyed. We made a special trailer focused on Ahsoka and Vader, and someone was saying that when Vader speaks, they didn’t think of it as Anakin. I thought, well, yeah, why would you? That’s Darth Vader. It’s kind of interesting to have that evolution. 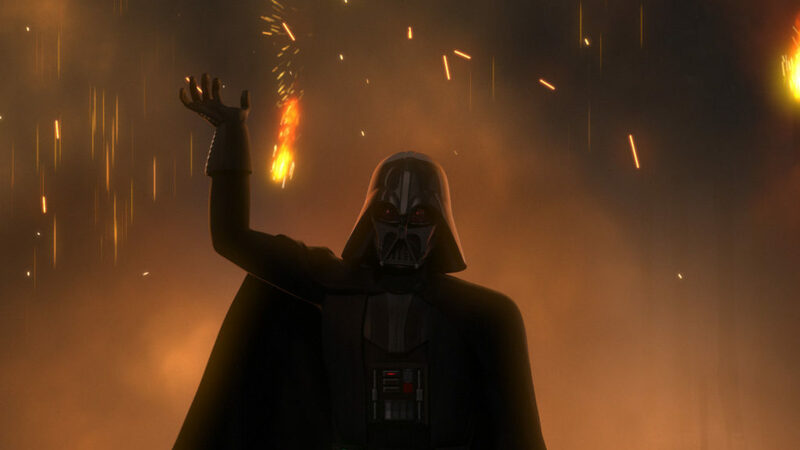 In Rebels, we wanted to see Darth Vader do things that we hadn’t really seen him do before, but still stay true to the character. One opportunity was showing Vader as a pilot. Anakin was a pilot, but we had never really seen Vader piloting the TIE fighter after A New Hope. So, there was a chance to do something with that starfighter and show Vader blowing away a rebel fleet, which was something we knew he did, but we never got to see. I was pretty pleased with the results. It felt, to a lot of people, like this was the Vader they had imagined. The fledgling rebel fleet is fighting the good fight, but with no base of operations, they have limited options. 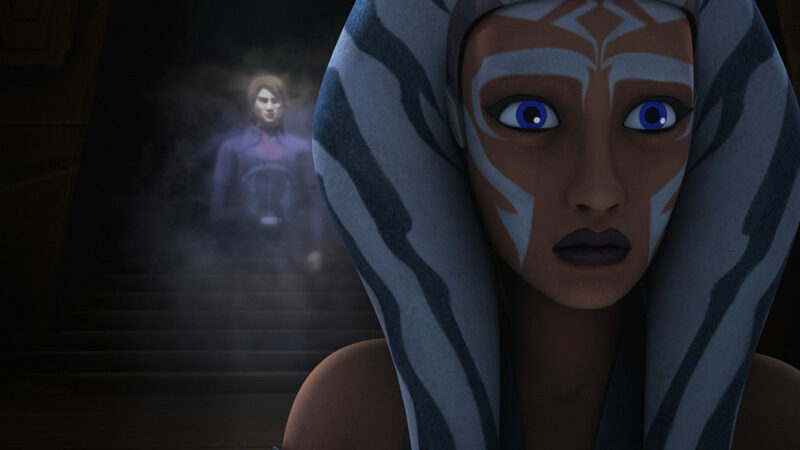 Ahsoka tasks the Ghost crew with finding an old friend who may have information vital to the rebellion. 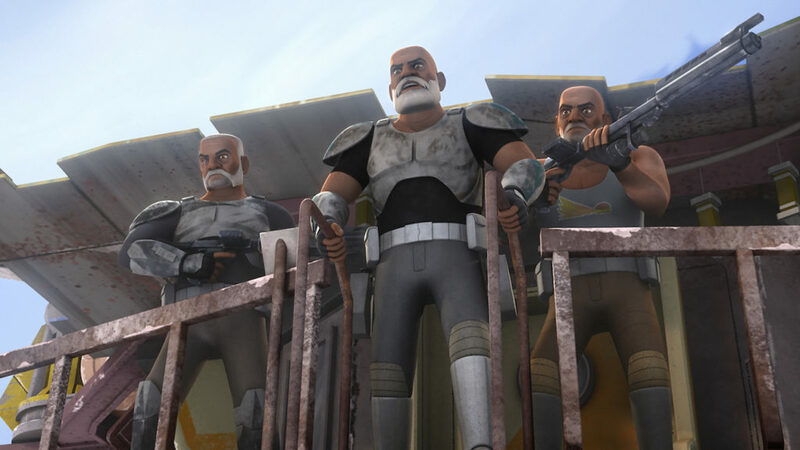 That old friend is none other than Captain Rex, who’s living out his (forced) retirement with Commanders Wolffe and Gregor on Seelos. 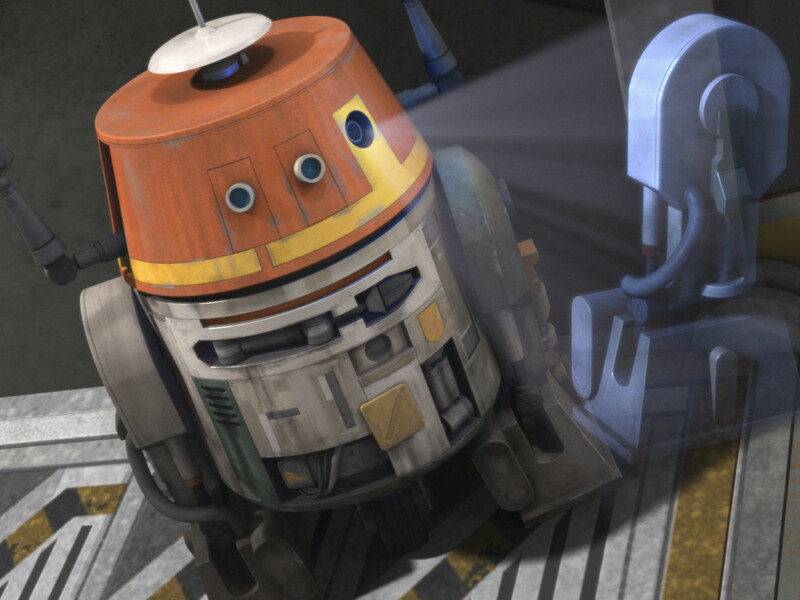 After an extended fight that may be one of the best of the series, Rex returns with the Ghost crew and is reunited with Ahsoka. Hondo makes his triumphant return! (He paid me to say that.) 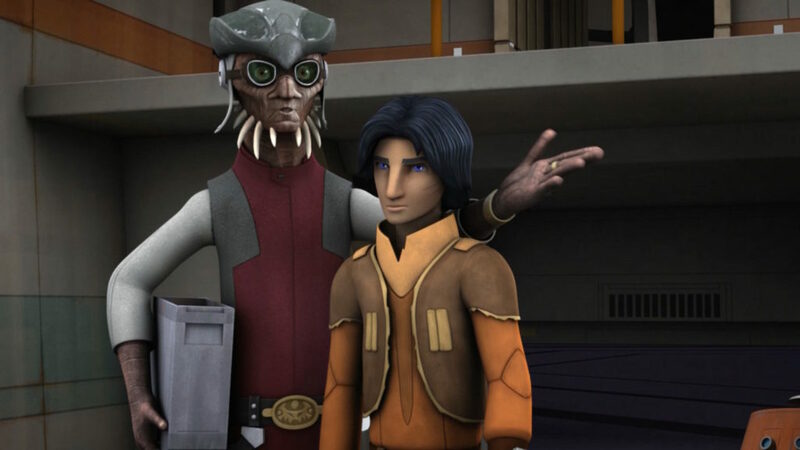 But he really does return and, being Hondo, takes Ezra on a wild adventure just when the Padawan’s fed up with all of the demands placed on him. 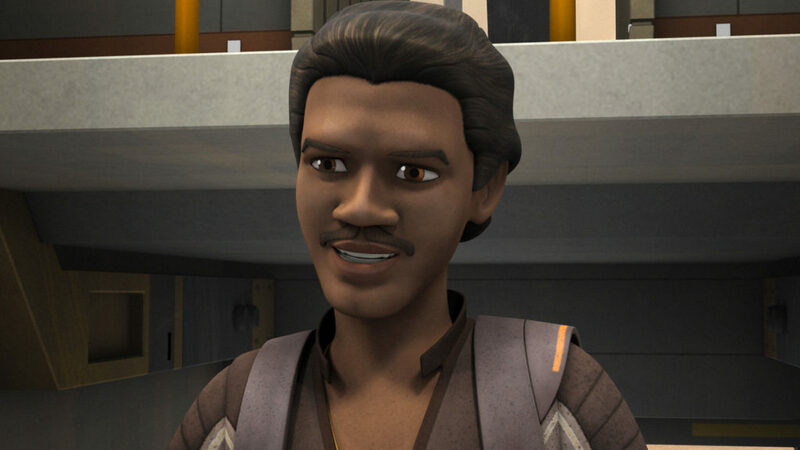 When Hondo suggests Ezra can be his partner and be a pirate Jedi, Ezra’s tempted. He ultimately realizes that, while he may once have been like Hondo, who he is now has him on a better path and he returns to the Ghost — with a little pirate’s booty that’ll help people in need. The Seventh Sister and Fifth Brother have traveled to Takobo and are tracking down and kidnapping Force-sensitive babies. 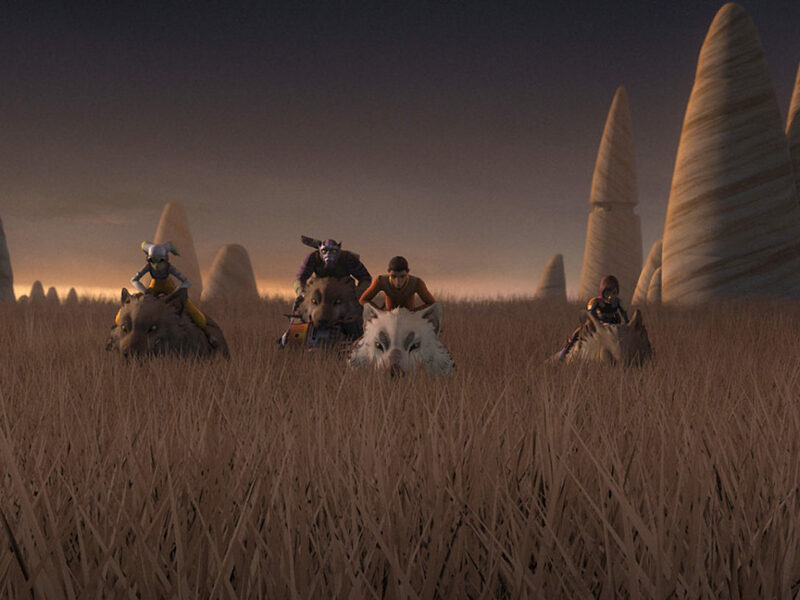 Ahsoka goes in search of one of the children while Ezra, Kanan, and Zeb look for another. 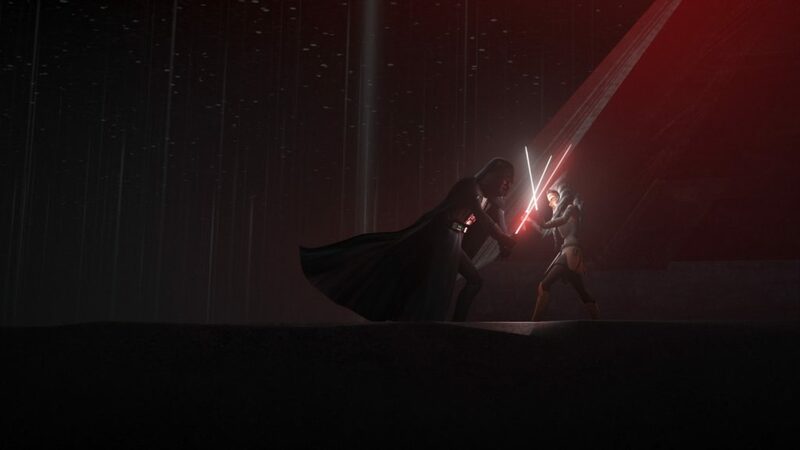 The Inquisitors find themselves face to face with Ahsoka Tano and, while they’ve been tasked with tracking her down, they discover she’s not about to go without a fight. 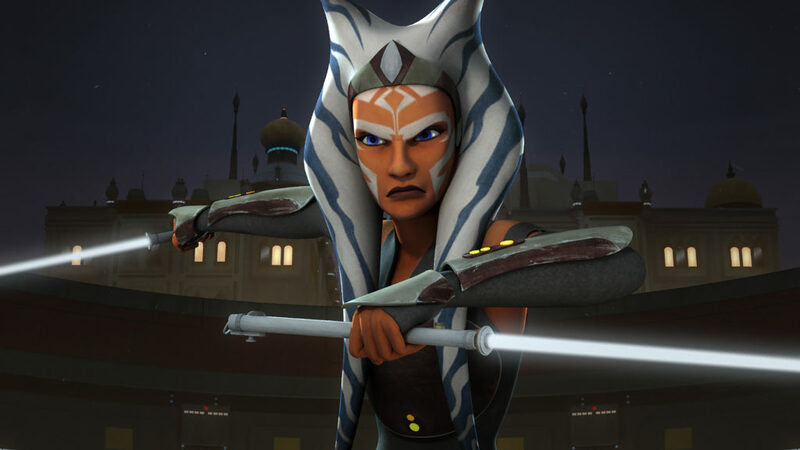 Unleashing her now white lightsabers, Ahsoka handily beats them both, proving that she may have left the Jedi Order, but she hasn’t given up her training. Before Leia Organa was a general or a rebel leader, she was a princess who did humanitarian work as part of a Senate-approved relief organization. Like her father, Leia works from within the Imperial Senate and its missions to help build the growing rebellion. Of course, her aid hasn’t gone entirely unnoticed and it means that the three ships she brought to Lothal to be “stolen” really will have to be stolen. Her arrival coincides with the sad confirmation that Ezra’s parents are dead, and it’s Leia who finds the right words at the right time. She may have grown up to become a senator and a general, but Leia Organa has always had the right words for any situation. When Ryloth finds itself under Imperial assault, they call the rebel fleet for assistance and we learn that Hera’s father is none other than famed Twi’lek rebel fighter Cham Syndulla. Hera takes on the mission to both help the Ryloth cell and acquire an Imperial carrier. We soon see why she and her father haven’t spoken in years. 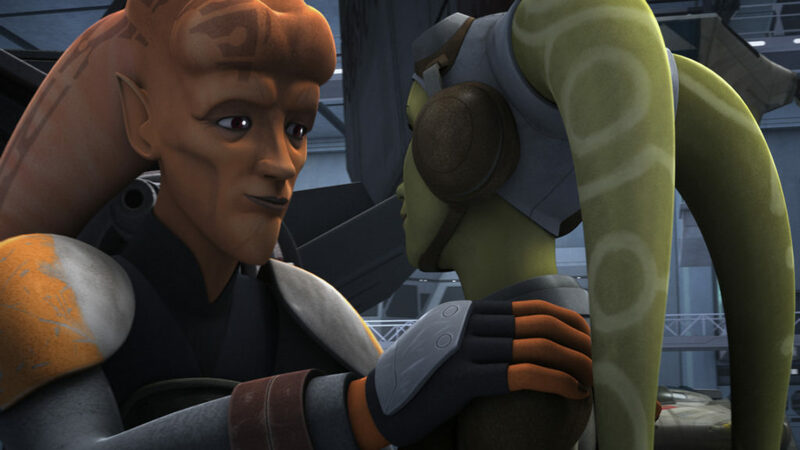 Cham wanted Hera to stay and fight for Ryloth, while Hera wanted to fight a bigger fight. In the end, Cham and Hera find a new understanding, but it’s touch and go there for a bit — and that’s what makes the episode so touching. 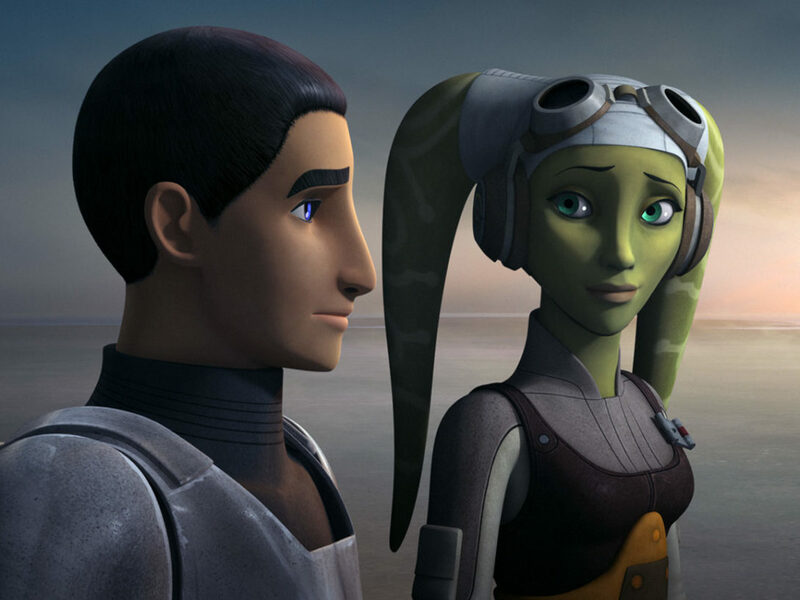 Do you think that it says anything about Hera that her bond with the Ghost crew is actually stronger than the bond she has with her own father? Vanessa Marshall: Well, I think that happens a lot, and I think that this show is very much about that phenomenon that sometimes friendship bonds can be stronger than blood. I don’t know if this is the case for everyone, but it seems like when one individuates from say, their family of origin, they become part of a [friendship-bonded] family. It’s almost like a rite of passage, choosing your new family, so it’s not that unusual. What they’re fighting for, obviously, is quite unique — forming the rebellion and stuff like that. But yeah, I think she’s such an ethical person or Twi’lek [Laughs], that I think those things mean the most to her, so for her to find like-minded individuals, and to bond so intensely with them, speaks volumes about her. That who she’d rather spend her time with is with people who care about the right stuff. And what’s weird is that it’s exactly what her father cares about. It’s just a different context. 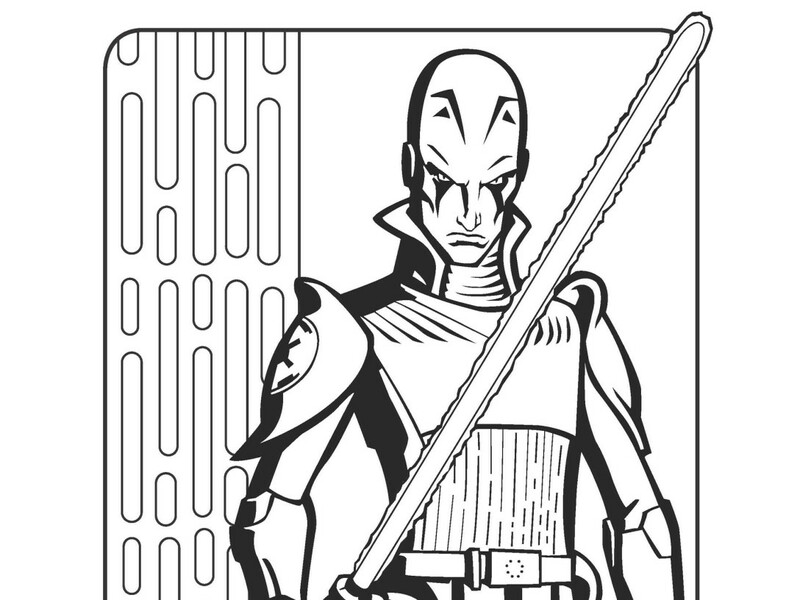 Whereas Cham only wants to do that for Ryloth, Hera wants to fight for universal justice. I am glad that Cham and Hera ultimately saw eye to eye, given this inherent similarity. 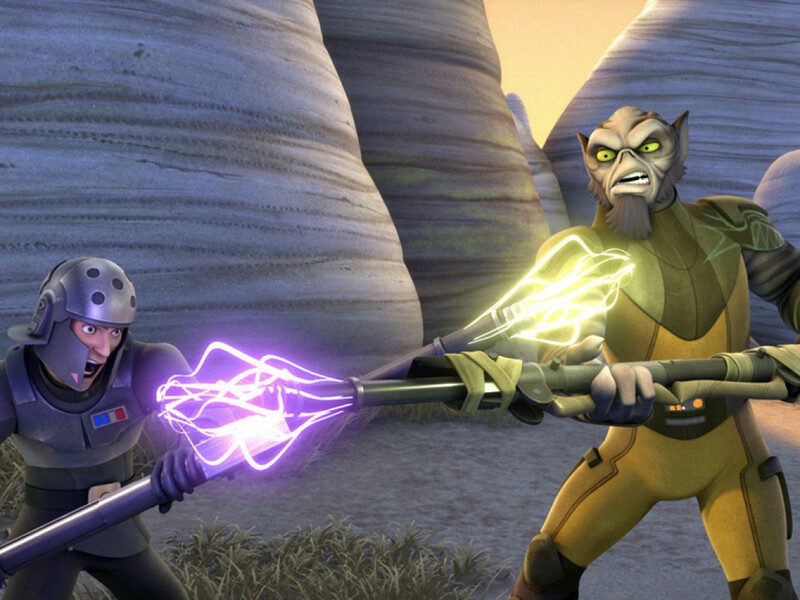 During a space battle, both Zeb and Agent Kallus are stranded on a Geonosian moon with only each other to count on. The two enemies have to work together to ensure their survival against the elements — and the denizens of the cave they’re trapped in. It starts out pretty much like you think it would, but as the two soldiers discover they’re more alike than they thought, a common bond is built and they get themselves out of danger. 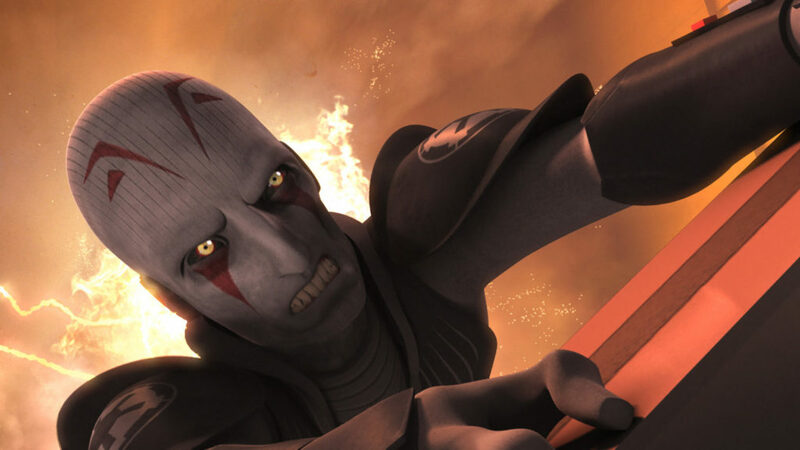 A new respect, grudging as it may be, grows and a larger question forms for Kallus once he returns to the Empire. What that exact question is, we don’t know, but it’s clear he’s been changed by the encounter. 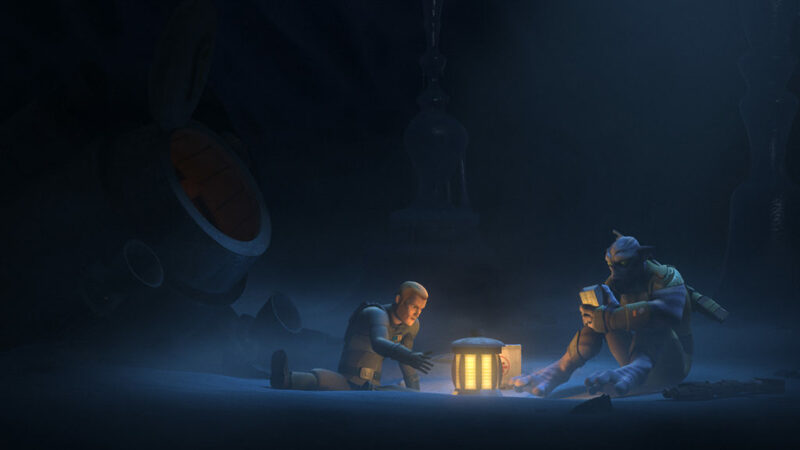 Kanan, Ezra, and Ahsoka visit the Jedi temple on Lothal to seek answers from Yoda about how the Inquisitors are able to track them and they find more answers than they expected. Each is presented a path through a door within the temple that provides answers and knowledge, some enlightening, some heartbreaking. Kanan’s trial ends with him being made a Jedi Knight. Ezra’s trial includes a discussion with Yoda, not about the Inquisitors, but on the larger question of the danger of the dark side. 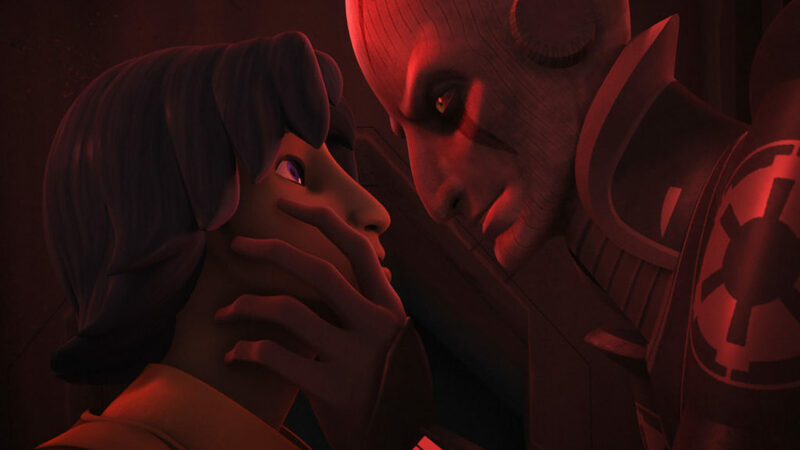 He also tells Ezra that they must go to Malachor for answers. But it’s Ahsoka who discovers the truth she’s been avoiding all along. Let me ask you about the scene in “Shroud of Darkness” where Ahsoka talks with Anakin. I really saw that as a bookend to their relationship. What were your thoughts going into the recording and can you tell us anything about the recording? After the premiere of Season Two, everyone was like, “Oh, Ahsoka knows. Ahsoka knows that that’s Anakin.” I, as a fan, didn’t feel that she knew. I felt like the thought that Anakin Skywalker could be Darth Vader was so terrifying to her, and really not even possible. Like, how is that possible? She blocked it out of her mind. She suppressed it so much. She loves Anakin Skywalker so much, and not to mention the guilt that she would feel of, “Could I have stopped that?” If she had stayed, could she have stopped that from happening? There are all these feelings of doubt and guilt that I think she just put away in her mind and thought that it’s not possible. So it really wasn’t until that moment that it became clear to her and, I mean, that’s just devastating. Anakin is family to her. So to find out that a family member is basically a murderer, it’s devastating. It’s just like if anyone were to find out that their family member murdered lots of people, how would you feel? It’s almost like you can’t even comprehend it. 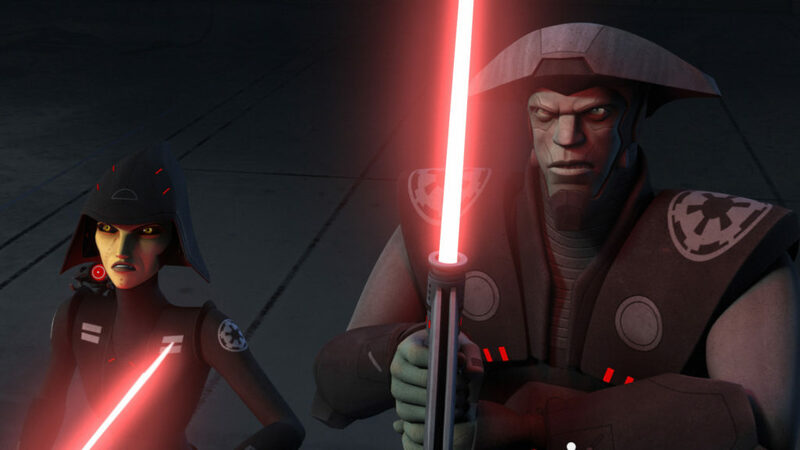 Vader and Ahsoka. Darth Maul. The Inquisitors. A Sith holocron. Multiple lightsaber battles. Death. Revelation. Sorrow. This episode stands as some of the best Star Wars ever — an emotional, thrilling climax to a memorable season. Now…are you ready for Season Three?